An unmatched resource for industry ratios and pricing trends in the printing industry! As many of you know, I served as a founding member and as the first Executive Director of the National Print Owners Association (NPOA). As a consequence, I spent the vast majority of my time dedicated to building the association and its membership, conducting dozens industry surveys and publishing research reports on its behalf. New 2016-2017 Printing Industry Digital Printing Pricing Survey was emailed to all qualified survey participants on Aug. 30, 2016. It is now available for sale to the general public. The retail price of this 114-page information packed study is only $229. Go below to read more about this new study. To order, visit our bookstore Here. Read article below and download a FREE PDF of four pages from this just-released study. Profit Leaders vs. Laggards – It’s Your Choice! >> View all past Articles here. 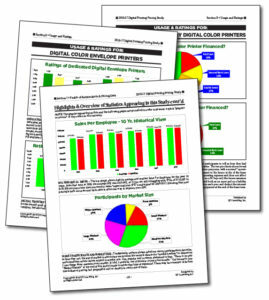 Comments Off on Packed With the Latest In Digital Printing Pricing Info! Comments Off on The Offset Printing Department – Alive & Well or in the ICU? Selling is All About Price! Comments Off on Selling is All About Price!